Our final Beers Made By Walking hike took place a couple weeks ago. We took an easy trail in North Cheyenne Canyon. The air was getting crisp, it was nearly dark by the time we got back to the parking lot, and the majority of trees had turned color. This hike was led by Kimberly Banzhaf, who we thank so much for leading four out of seven of our hikes. The homebrewer that came along this time was Matt Kupferer. The idea is that we identify edible plants along the trail and then Matt creates a recipe based off what we find. The beer is then produced up in Monument at Pikes Peak Brewing and is sold for one night only at Brewer's Republic in downtown Colorado Springs. Guess what? The tasting for this beer and three others is this Saturday! 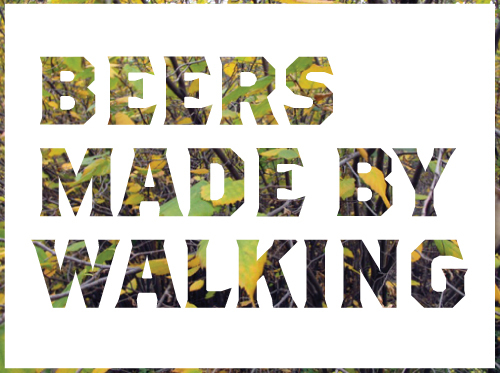 Beers Made By Walking has nearly come to a close and it was quite a bit of fun. I didn't get the best photos on this hike but I'll show you what I can. Matt is the guy here with the whitish ball cap. We're just beginning the walk at this point. We walked through a grove of scrub oak before the trail butted up right against the mountain wall. Near the beginning we came across Beaked Hazelnut. Nearly all the leaves had fallen and there were a couple old hazelnuts on the ground that the squirrels had rejected so we took a look at those. Later we found some wild sarsparilla, which just so happens to look an awful lot like poison ivy. We had done a preliminary scouting hike just five days beforehand and found a good amount of the sarsparilla but on this day we only found one example because all the leaves had fallen. As it turns out, wild sarsparilla and the hazelnut are remnants from the last ice age. Neither of those plants grow in any abundance along the front range and, in fact, North Cheyenne Canyon is one of only a couple places where it continues to grow. Our pal George Cameron came along on this hike. He led a previous hike at Red Rock Open Space. This was really the only hike where people needed to wear something warm. Here's Kimberly talking to us about a species of birch. This was the point in the hike where we turned around and headed back. It was probably our shortest hike, if you don't include the one that was canceled due to the lightning storm. We also saw Mountain Ash, Spruce, there was an apple tree near the parking lot, Rocky Mountain maple, wild raspberries, and a few other plants. Matt ended up choosing to brew an American-style Stout. He's always wanted to make an alcoholic root beer, so he ended up using sarsparilla. He also decided to add hazelnut and spruce. I am pretty excited about this one in particular because we saw so many unique plants that really don't grow along the front range except for a few small spots. The beer will end up being a good portrait of this particular location. Matt's beer, along with three others will be served this Saturday, October 29th at Brewer's Republic from 4-8pm. The cost is $5 to get in and get samples of all the beers, which will be served on handmade sample trays that I made out of Beetle Kill Pine. Take a look at the photos from the last tasting event.